Rebecca completed a Bachelor of Dentistry (with the award of Honours) at the University of Sydney in 2008 and a Bachelor of Medical Science at the University of Sydney in 2004, majoring in neurophysiology and pharmacology. 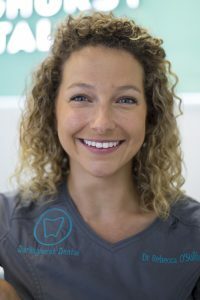 Rebecca has a caring and gentle approach to providing dental treatment, and is excellent with children. She places a strong emphasis on prevention, and regularly attends continuing education courses and advanced training programs in dental aesthetics (cosmetic dentistry), crown and bridge, and endodontics (root canal therapy). She has professional memberships with the Australian Dental Association (ADA) and the Royal Australasian College of Dental Surgeons (RACDS). In her spare time, Rebecca is an avid rock climber, and enjoys painting and sketching.